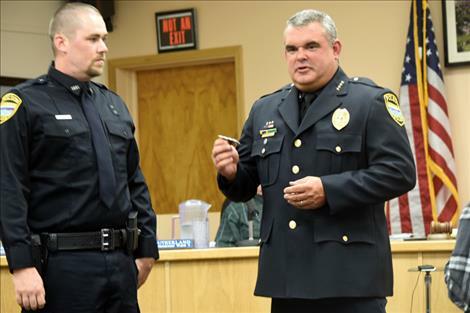 Polson Police Chief Wade Nash, right, presents new Polson officer Mathieu Gfroerer his pin. Paul Laisy, retired Missoula Rural Fire Chief, speaks to the commissioners about the fire department split. 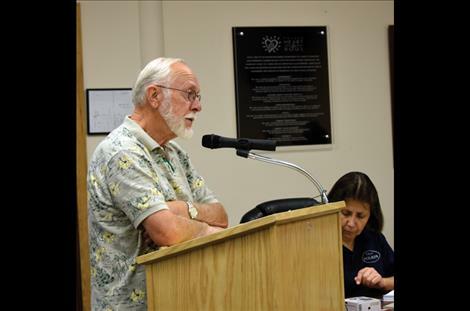 POLSON — A packed agenda led to a three-hour Polson City Commission meeting on Sept. 7 before commissioners went into executive session to discuss City Manager Mark Shrives’ annual review. One agenda item generating a lot of comments and concerns was Polson Landing, an affordable housing project brought forth by Alex Burkhalter, Housing Solutions developer. Proposed was a 25-unit affordable housing project in the Ridgewater subdivision. The project would be funded by Housing Development Corporation, a federal tax program that is administered by the State of Montana, and the Montana Tax Credit, instituted by the state 10 or 12 years ago. Burkhalter would need to submit his plan to the Montana Board of Housing by Oct. 5. Developers present their projects verbally to the MBOH on Nov. 9., and the board makes their decisions in January 2016. A letter of support from the Polson City Commission; sending a representative to Helena to speak to the board in favor of the project; reduction in parking requirements to 1.5 parking spaces for each unit; and Burkhalter proposed the city make a “soft” loan to the project to pay the impact fees, approximately $150,000 to be repaid in 17 years. The project would be tax exempt, and Commissioner John Campbell disagreed with this, saying it was his only problem with Polson Landing, subsidizing one group of Polson residents while other folks have trouble paying their property taxes. “Impact fees says it all,” Campbell said. Burkhalter said they could discuss Payment in Lieu of Taxes to deal with no property taxes. Other questions included whether the 25-unit project would have a property manager, and who would do the maintenance and upkeep. Burkhalter said there would be an onsite leasing office, and Home Solutions would contract for maintenance or maybe a tenant would have the skills necessary. Turner said he liked the idea of the project. “A lot of members of this community have the capability of putting this project together. Nothing personal,” Turner added. Mayor Heather Knutson asked about the community’s need for more low-income housing. “I honestly don’t know what our capacity is or if we’re fully rented out,” she said. Dennis Duty, local developer, agreed with Knutson. “The real question is — what is the need?” Duty said. He didn’t think Burkhalter had defined the need for low-income housing in Polson as well as he might have. Duty added that he hates to throw the project out without knowing the real need. What about the list of four items? During public comment on the issues, local developer Hans Lund remarked on the overall scope of the project. The figures came out to be about $180,000 for each unit. “You could build a 2,500 sq. ft. house in Polson with that,” Lund said. Apartment owner Tracy Sherick spoke, too. Her family has 20 apartments, which range in price from $410 to $600 per month with utilities paid. Resident Dave Sheesely voiced his opinion, saying that if people move to this area expecting housing and there isn’t any, there will be people sleeping under the bridge and in the parks. He asked who would pay for the schools, the sewer plant and the streets. Commenting that a 1,000 sq. ft. house with impact fees and taxes would be a better deal than $177,000 per unit at Polson Landing, resident Lee Manicke said he’s just not sure Polson Landing is what ought to be built. If those units are tax exempt, the people who are already paying taxes will continue, and Polson and Lake County schools will (eventually) raise their taxes. Commissioners, after much discussion, tabled the issue until the Sept. 21 meeting. “The current suggestion is submitting a letter of support and sending a representative to Helena but not doing a soft loan or requesting a PILT,” according to Knutson. In the meantime, new city planner Kyle Roberts will research the issue, checking on rental units, waiting lists, etc. Burkhalter will provide commissioners with a preliminary market study. Earlier in the day City of Polson dignitaries John Campbell, commissioner; Dave Simons, building inspector; Karen Sargeant, parks superintendent; and Mike Johnson, assistant parks superintendent, with assistant from John Campbell, Jr., planted a honey locust tree in Ducharme Park in memory of Dan Morrison, former city commissioner. Polson City Manager Mark Shrives said there will be a dedication ceremony in the spring. Knutson swore in new Polson Police Officer Mathieu Gfroerer and Gfroerer’s wife Arlene pinned on his new PPD identification. Honoring the Polson Police Department, the commissioners passed Resolution No. 2015-20 to establish an appreciation of service season from Sept. 9 through Oct. 17. It will be designated a blue ribbon season, with blue ribbons being sold and worn to recognize, support and appreciate the Polson Police Department. Funds from the sale of the blue ribbons and a spaghetti feed put on by city employees will go to William Cleveland, a PPD officer currently experiencing serious health issues. In other business, the commission awarded the contract for biosolid removal from Cell No.1, to remove the sludge so design can begin for the wastewater plant project. The contract went to Sandry Construction for $88,500. The next Polson City Commission meeting will be Sept. 21 at 7 p.m.